When speaking to a customer or potential customer, no one wants to be caught off guard with an unexpected question. Eagle Chat Online makes that a thing of the past. 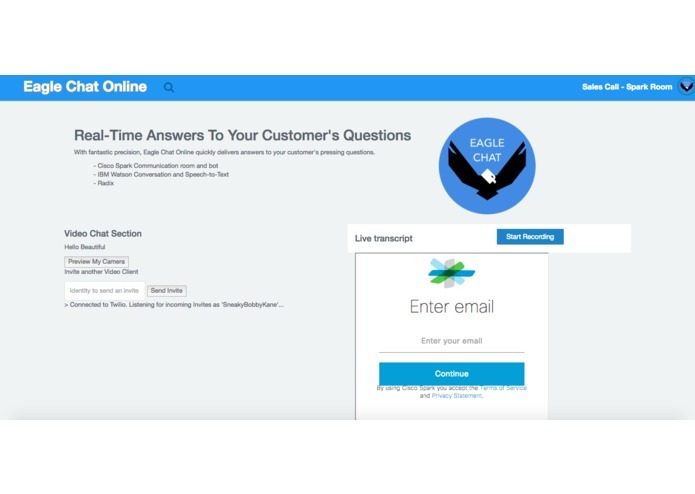 By analyzing the conversation in real-time, Eagle Chat Online identifies the customer's question in real-time and immediately displays a common-used answer that others in the organization have used with their customers successfully. We use IBM Watson to convert the conversation speech into text, then analyze the content of conversations and identify the customers' questions. We also use IBM Watson to analyze the question and produce relevant answers. We use Cisco's Spark bot to make those answers available to the salesperson in real-time. We use Twilio for the live chat.